A simple shared group calendar app. Share calendars with your Partner, Kids, Family, Friends, Sport team or any other group. • Create simple shared calendars for both groups and personal use. • View the calendars together or separately. • Add events to group calendars so every participant of the group calendar stays up-to-date. 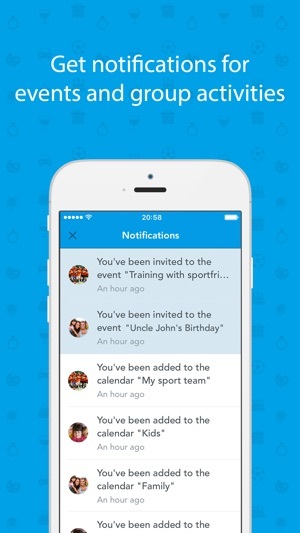 • Receive notifications when new events are added to a group calendar. 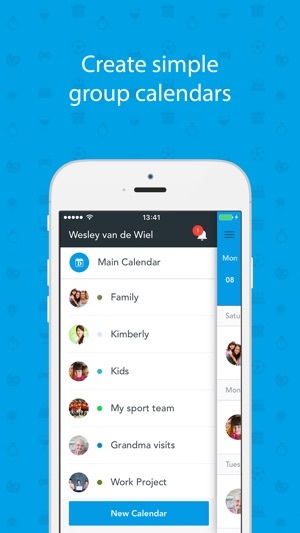 • Invite others to a group calendar in just 1 simple step. • Respond to events and see who's attending. • Receive reminders before the events start. • All participants of a group calendar can manage the calendar. Simple and fast. • Add personal pictures to them calendars and view the calendars in different colors. You can create a simple group calendar with Dayhaps for any group. Dayhaps is an easy to use shared calendar app and free for all users. We do appreciate feedback and reviews :). - Partner: to keep track of each other’s planning and see the coming events. No need to call each other anymore to ask about the calendar in the kitchen. No risk of forgetting to write down events after you received them in a text message. With Dayhaps shared calendar app it's easy to keep track of the activities. - Kids: keep track of coming events of your kids, share them with your partner and with your kids themselves at the same time. When are the swimming lessons? When do they have classes? Or when are the dentist appointments? When do they come home to visit in case they’re already living somewhere else? 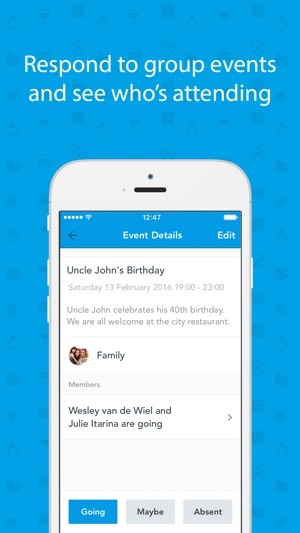 - Parents: Some users told us they use Dayhaps as a shared calendar app with all brothers and sisters. They created a group and use it to keep track of all the visits. An easy way to plan the visits to the parents and keep track of appointments that are needed to take care of parents. All brothers and sisters are sharing a group but still they have all their private activities separated in other calendars. 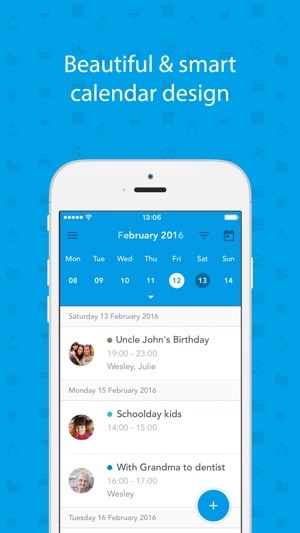 - Family calendar: keep track of birthdays or other events in the family calendar. Share a calendar about visits to grandma or about who and when will take care of the older parents in the family. Dayhaps is a great family calendar app. - Sport team: create a group calendar with your sport team. Easier than sending messages who get lost and forgotten all the time. Simply create a group calendar and add the events to it. The whole team will get reminders and see the future events without having to write down a single line in the shared calendar app themselves. - School class: If you like you could use Dayhaps calendar app as a shared calendar in the class. All students can be added to one group and stay up to date this way. In case any student adds an event to the group calendar the shared calendar app will automatically inform all participants of the group. - All other groups: create group calendars apps for any other group you can think of. When did you plan things with friends? Need to share a calendar with the school class? A Work project? After work courses? If you have any questions or need help please send us an email, text message or contact us through social media. Check out our website for support. START CREATING GROUP CALENDARS TODAY! Get started today by just downloading the app and create the groups you like. If you have a team and you guys are working together to boost up one of your big projects. I'm sure that you need to organize many events to regroup and present what each members did. But how can you handle all events have no one absent . 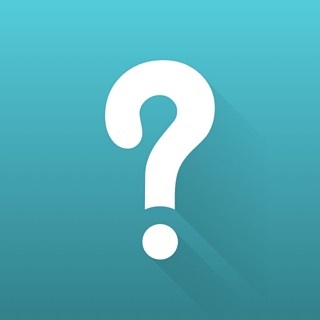 Introduce this app to your team and your problem would be solved . So easy ! Top leading in orgnazing events! This app is really useful! Basically the best organizing app out there. Group appointments and plans are managed effectively and user friendly than other competitive apps. I highly recommend this app for people who have many friends to meet and many appointments to keep in mind.